Miriam’s Kitchen knows that people with lived experience of homelessness - people like me - are experts in ending homelessness. I know how it feels to be homeless and what hurts about being homeless because I’ve been there and lived it. Make consulting people with lived experience a priority. Directly consulting with people who have the lived experience of homelessness is vital to ending chronic homelessness. Every organization can and must ensure that people like me are engaged in decision-making, from how programs are run to what to advocate for. To ensure this happens, organizations should have dedicated staffing and resources for client engagement, create intentional spaces and structures for consultation and feedback, and ensure organizational buy-in. Create intentional partnerships with consumer advisers. Miriam’s Kitchen has a decade-old partnership with the People for Fairness Coalition (PFC), of which I'm a member. PFC works to end housing instability through outreach, advocacy, and peer mentoring. We are different from other advocacy groups because every member has experienced homelessness. Miriam’s Kitchen stands with us to strategize, amplify our priorities, and share resources, such as dedicated staffing, funding, and space. Elevate the voices of people with lived experience. Miriam’s Kitchen handed me the megaphone so I could amplify my voice and take action. Earlier this year, Miriam’s Kitchen and 95 other organizations joined The Way Home Campaign for The March to Make Chronic Homeless History. Speakers with lived experience of homelessness shared their stories and offered solutions to end homelessness. I led the crowd in chants as we marched to the Mayor’s office. I was going to make sure the Mayor heard us and that she understood that DC needs to end chronic homelessness. Before that moment I felt powerless, but with the megaphone in hand and the crowd behind me, I knew I was powerful. I used to be scared to stand up for myself. Now, I do have a voice and I know how to use it. Over the past six months, driven by my personal experiences, I’ve advocated for a Downtown Services Center. I know the gaps in DC services first hand, like how hard it is to both keep your belongings safe and replace things, like birth certificates, if they are stolen. 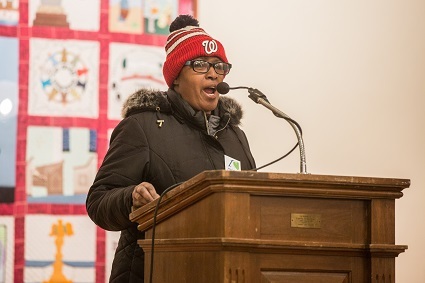 I’ve used my fellowship to testify before the DC Council and urge Councilmembers to support a centralized location where people can have their basic needs met while working towards housing. Recently, DC invested $2 million to create Downtown Services Center, which I don’t think would have happened without the advocacy of people who have experienced homelessness. Without us, paid advocates wouldn’t know what to advocate for. We are proof that homelessness exists. For us, this is about our lives. Understand that guest engagement is connected to racial equity work. Miriam’s Kitchen connects guest engagement to racial equity. Disproportionate numbers of people who experience homelessness are people of color, most of whom are Black. This is not a coincidence. Racial equity work helps explain why some groups have resources while others do not. As a Black woman, I see and feel the sting of racism every day, and I know that we cannot keep deprioritizing the needs of Black people. 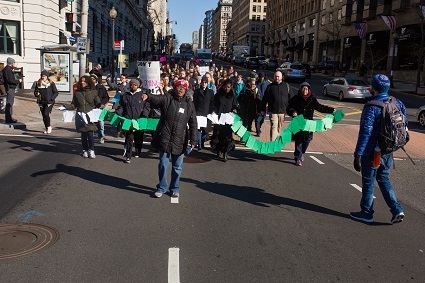 People of color and people experiencing homelessness often have their voices silenced, their experiences marginalized, and their bodies stigmatized. To end chronic homelessness, we must address racial inequity and we must center the voices of people who have been silenced in all that we do. Now I can use my power to change my life and change the world, as I’ve learned skills that have helped me navigate my own homelessness. Before, if I was turned down from an apartment, I would have moved on. Now, I know what questions to ask. I can stand up for myself and fight for what is right. I’m able to tell advocates about the barriers I have faced so that we can advocate together to end discrimination against people experiencing homelessness. Today, I feel a part of something bigger than myself. I am proof that you can tell your story to people in power and make change in your community. As my fellowship ends, I am confident in myself and I know that I am a leader. I have found my voice and I can use my power. Miriam’s Kitchen works to end chronic homelessness in DC through meals, case management, permanent supportive housing, outreach, art therapy, and advocacy.